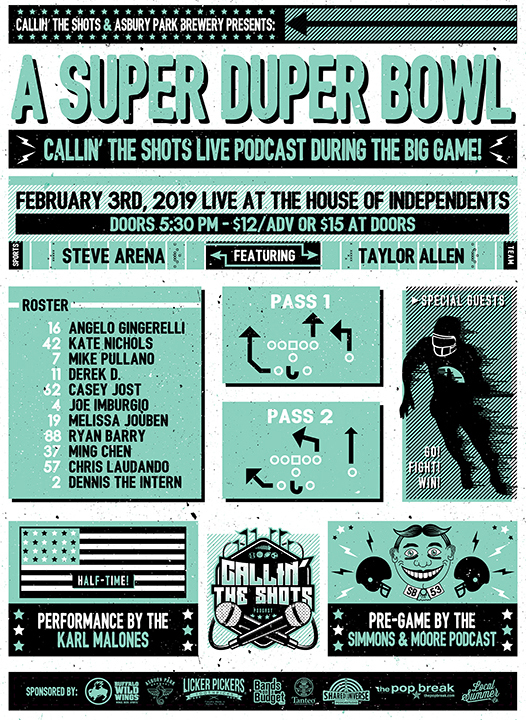 During the Summer of 2018 we were hired by our friends at the Callin’ the Shots Podcast to design the poster and advertisements for their huge Super Bowl 53 event in at the House of Independents in Asbury Park, New Jersey. The few bullet points we were told was that there would be a lot of performers, a lot sponsors, a few taglines, had to have some ‘Asbury Park’ connection and had to involve Tecmo Bowl. What seemed a bit daunting in the beginning turned out to be a lot of fun for us. Once we decided on doing an info/ grid system and focus on graphic design instead of our usual ‘hero graphic’ poster, things flowed smoothly. We decided on a limited 2-color pallet with the thought-in-mind to possible make silkscreen prints for the event. Once we pulled our favorite teal/green swatch from the Palace Amusements building and threw on Tillie, we pretty much hit all of the bullet points. We took the nod from Tecmo Bowl and included 2 special plays (these had a purpose, if you remember) as well as took some inspiration for the stylized player, half-time and pre-game screens. We’ve had a long-term working relationship with the folks from Callin’ the Shots and are always psyched when they come around for more.